Throughout her 29-year career at NIU, Cathy Cradduck has served as administrative support for two former NIU presidents, and for vice presidents in administration and student affairs. Now, as an administrative assistant for the Division of Research and Innovation Partnerships (RIPS) vice president, Cathy provides high-level support while significantly improving operations and taking on new challenges. Cradduck’s responsibilities include day-to-day-operations, program support and offering assistance associated with unfilled vacancies for administrative and programmatic staff. Most recently, Cradduck quickly stepped in and assumed the duties of two staff members in the budget office of the Division. “Well beyond her role in providing direct support to Vice President Blazey, Cathy often steps in to help provide administrative support throughout the Division. She foresees problems and takes initiative to make sure everything runs smoothly,” says Dara Little, assistant vice president for Research and Sponsored Programs. Appreciated for her strong attention to detail and operational expertise, Cradduck streamlined the administration of the campus-wide Research and Artistry grant program. With approximately 75 annual applications, to be reviewed by roughly a dozen faculty, coordinating the process took a tremendous amount of time. “Not content to follow past practice, Cathy improved the process to better meet the needs of applicants and the selection committee, resulting in a more effective and better managed program,” says Blazey. Cradduck has also made admirable contributions to the broader university and local communities. She has managed university participation in the Department of Labor Workforce Investment Act program, carrying responsibility for the program for fifteen years across multiple positions. She served on the Operating Staff Council Committee to Endow the Dependent Scholarship Fund. The efforts of the committee and their campaign “Just One Dollar” led the endowment, which ensures the competitive program continues for NIU dependents attending state schools. 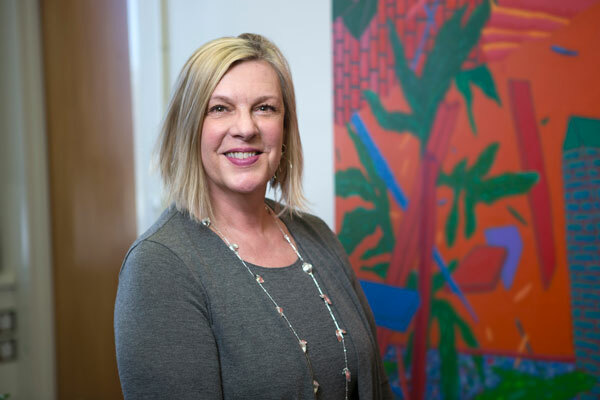 Cathy also served the NIU Annuitants Association and has been involved with the military spouse program, a federal program created to assist students with a deployed spouse. Cradduck served on the DeKalb County Coordinated Child Care Board of Directors and donates her personal time and resources to the welfare of homeless animals. Recognized for her service both inside and outside the NIU community, Cradduck was honored with the 2018 Operating Staff Outstanding Service Award.